DUMBARTON were taken apart by Inverness Caledonian Thistle at as sun-drenched Caledonian Stadium. 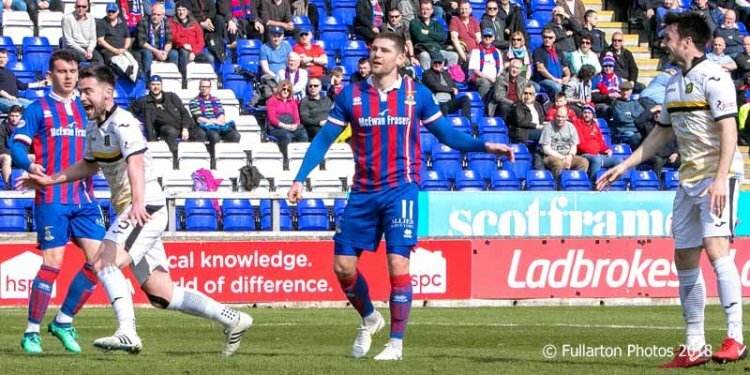 DUMBARTON were taken apart by Inverness Caledonian Thistle at as sun-drenched Caledonian Stadium and lost 5-1 to the team who beat them in the final of the Irn-Bru Cup. Comeback man Grant Gallacher — enjoying his first start for months — put the visitors ahead, scoring from an Andy Stirling cross. The home side levelled quickly when Aaron Doran fired home from long range, before Nathan Austin made it 2-1 by rounding keeper Scott Gallacher to score from a tight angle. Austin killed the game shortly after half-time with his second and Inverness's third. Iain Vigurs scrambled home a fourth before Austin claimed the match ball with his hat-trick. Sons are now eight points behind 8th placed Falkirk with nine points to play for in the race to avoid the Championship relegation play-off. Now they face Inverness at home desperately seeking revenge.